Balance - Wisdom at Work: InnerWork Technologies, Inc.
We are grateful to His Holiness the Dalai Lama for kindly offering his inspiring foreword for our book and to our many inspired teachers and colleagues whose insights we have shared in these pages. Humankind has always been faced with problems, and in different parts of the world, at different times, people have come to varying conclusions about the nature of these problems and how to tackle them. One of Buddhism’s most relevant lessons is the avoidance of extremes. It teaches that freedom and happiness will not be found in the extremes of either sensual indulgence or mortification: a middle way must be found. Today there is an overemphasis on the external world. Science has rapidly extended our understanding of external phenomena, and technological advances have contributed to improved health and physical comfort. Yet even in the most developed countries we do not find a corresponding increase in peace and happiness; if anything, there is greater anxiety and stress. Fear stimulates the need for terrifyingly destructive weapons systems, while greed gives rise to damage and pollution of the environment, putting the very existence of humanity at risk. These trends are symptomatic of the dangers of pursuing external progress alone. What is missing is a corresponding inner development. To redeem the balance, our new frontier should be the inner worlds, and not the outer space. If the mind is explored with the same stringent scrutiny applied in other branches of science, it will certainly be of immense benefit not only to individuals but to society as a whole. Within the world’s contemplative traditions can be found numerous methods for investigating and training the mind. This book summarizes why the adoption of such “inner science” is necessary now, and how interest has grown in the search for compatibility between contemporary needs and ancient techniques. It presents an array of methods for transforming the mind. These methods may seem relatively simple, but to be effective they must be applied steadily in a rigorous, rational way—much as a physicist or a chemist conducts his experiments—so that the inner scientist may both test and become familiar with them. This book will be of equal use to anyone interested in exploring and transforming the mind. As more people achieve some degree of mental calm, insight, or the ability to transform negative emotions into positive ones, there will be a natural reinforcement of basic human values and consequently a greater chance for peace and happiness for all. 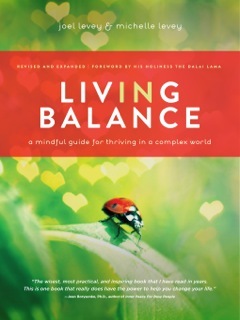 “In this book, Joel and Michelle offer us all that we need to create a meaningful and balanced life. Anyone who follows these practices and teachings will become a blessing to others, a refuge for all beings. The revolution we seek must always come form the inside out. Author of “Minding the Body, Mending the Mind,” and “A Woman’s Book of Life.” Cofounder and former director of the Mind/Body Clinic, New England Deaconess Hospital, Harvard Medical School. Author of Why People Don’t Heal and How They Can; and Anatomy of the Spirit. Sylvia Boorstein, Author of It’s Easier Than You Think: The Buddhist Way to Happiness; Don’t Just Do Something, Sit There; and That’s Funny, You Don’t Look Buddhist. , Author of Growing Myself: A Spiritual Journey Through Gardening. Gardening columnist Vogue Magazine. Gardening correspondent/editor NBC ALL-NEWS Network Radio. Host/writer for “Inner Gardens” cable TV series.